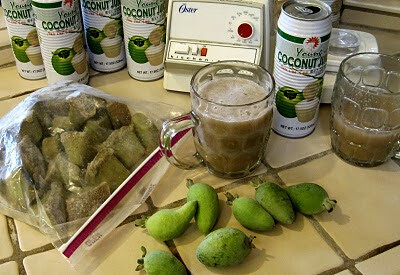 Later today I will harvest this year’s last feijoas (a.k.a., pineapple guava, or guavasteen; Acca sellowiana, syn. Feijoa sellowiana). A few I will spoon out and eat fresh, but most I will puree and pour into ice trays. The fruit comes ripe in October, but I find its robust flavor most agreeable on hot summer days, and then iced and diluted with coconut juice. Most gardeners allow their feijoas to fall to the ground, unused. As a shrub or small tree, it makes a nice hedge or stand-alone ornamental. The fruit falls while still hard, and then needs a day or two before it softens to the touch and is ready to eat. Left on the ground, they go bad quickly, but I set mine in a box indoors until I can process them. 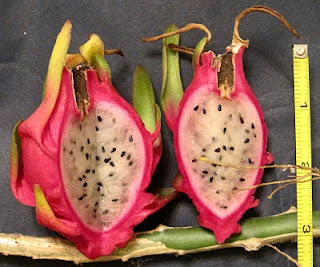 The fruit packs a burst of unique flavor, sometimes more than the uninitiated is prepared for, and especially when left in the skin. 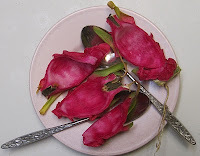 It compares to a citrus zest, with uses in salsas, chutneys, or sweetbreads, but even diced small in a fruit salad, I have seen plates come back to the kitchen with the feijoas pushed to the side. However, almost daily throughout this past summer, I enjoyed a frothy mug of iced feijoa-colada, from cubes I froze this time last year. 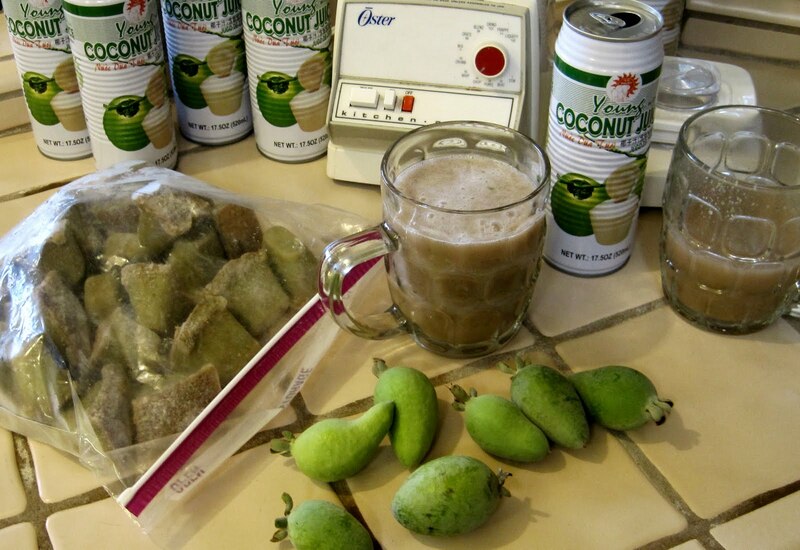 When pureeing the feijoa, skin and all, I use canned coconut juice for any necessary liquid, and then use chilled coconut juice to blend the drink on the sweltering summer days when I am ready to enjoy it. The two flavors balance well, zesty but sweet, and require no additional ingredients. Many Novembers ago I came home from a farmers’ market with a collection of persimmons, pomegranates, and kiwis. I mixed them in a salad and was so pleased with the results that it became my default offering for any potluck or party between Columbus Day and New Years’. Now I have all three planted in my yard. I’m a devotee of local fruit. I like the colors in this salad, as well as the flavors and textures. The kiwis are soft, sweet, and gently tangy. The fuyu persimmons add crunch like a crisp pear and hint at cinnamon with their flavor. The pomegranates explode between the teeth and turn to a winsome juice. (Some varieties can be a little tart, but the one I grow is wonderful.) Occasionally I’ve thrown in late-harvest grapes (a purple-black variety is available in my local farmers markets), or fresh pineapple if I’m willing to cheat and add a yellow import. The slicing and husking for a large bowl of this salad takes about an hour. 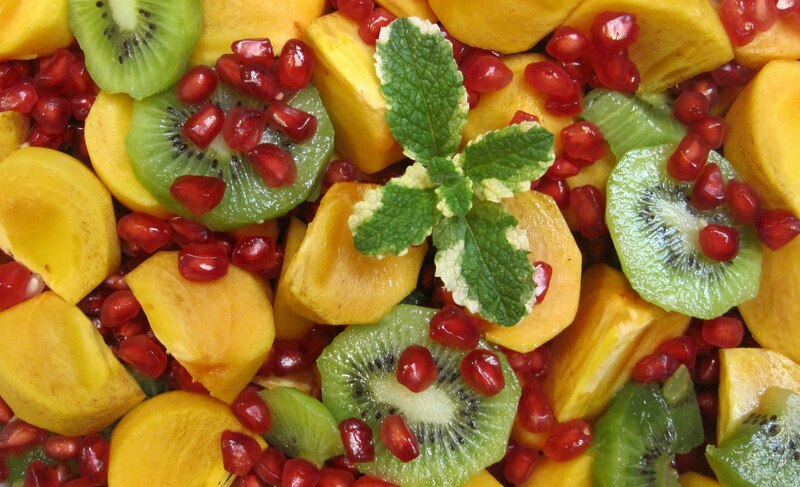 Most varieties of kiwis require peeling, while pomegranates must be carefully coaxed from their shells. Persimmons can be eaten in the skin, but for salads I prefer to take it off. Both pomegranates and persimmons are long-lived in a fruit bowl (and longer with refrigeration), but the kiwi presents itself with a shorter window of readiness. I have kept them in a frig for up to ten weeks, but I’ve learned to put soft ones in cold storage and hard ones out on the sink four to seven days before I will need them. The photograph shows the version I made tonight. I had three helpings at dinner, and may have another bowl before bed. Enjoy. It’s always fun to be anthologized. It means an author interested in a subject surveyed the available literature and found one’s offerings noteworthy. That kind of complement puts an extra zest into sitting down at the keyboard for one’s next efforts. Debbie Macomber has had a career in fiction that proves the power of plodding. I heard her tell her own story at the Mount Hermon writer’s conference, where she was the keynote speaker in 2008. A dyslexic with only a high school education and toddlers to care for, she yearned to be a novelist. Macomber tells the story with humor, but what I took away concerned a tenacity that eventually paid off with over 150 novels published, and over 60 million copies sold. Within the industry, people also mention her stunning accomplishment in maintaining a mailing list with every person who ever expressed an interest in her writing (begun in a shoebox, before the advent of computers), and her use of that list for a steady output of thank-you notes and personal invitations anytime she would be appearing in an area or releasing a new book. Macomber was fun to listen to, and some of her modules show up in this volume, one of her rare ventures into non-fiction. Of course, that’s not why I’m plugging her book on my blog. However, the explanation begins with that same 2008 conference at Mount Hermon. It's a right-place-at-the-right-time story about getting into an anthology of right-place-at-the-right-time stories. There, at a meal, I briefly met Janet Kobobel Grant, of the Books and Such Literary Agency. 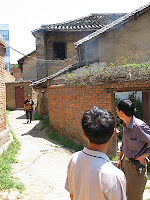 After the conference, I put the agency blog, Between the Lines, on my reader. The agency’s members rotate the duties and host one of the better daily conversations about writing and the publishing industry. Over these 30 months, I have joined in when the topic brought something to my mind. A writer is only a writer if he or she writes. 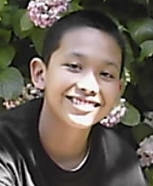 My problem is that teaching junior high school is an extreme sport. After running 7:30 to 3:00 on adrenalin, trying to stay one step ahead of 120 teens, the kids leave and I go brain-dead and drowsy. Sometimes in the evening I write tests or worksheets. I don’t have the oomph to work on my novel. But a couple times a week I might have the energy to craft one good paragraph and leave it somewhere on a blog. For an unpublished author, that kind of opening line from a respected agent is about as good as it can get. But it got better. Wendy explained that she was working with Debbie Macomber on a book project and they wanted my permission to include an anecdote I had posted on their blog. It’s an account from my 2004 trip to China. I’d already reported a variation of it here, but it was a rich enough experience that it could be told from a dozen different angles, each supporting a different thesis. In this case, I offered it in response to comments Wendy had posted about literary pilgrimages. The upshot is, this week’s mail brought a signed copy of Debbie Macomber’s new book, God’s Guest List: Welcoming Those Who Influence Our Lives. (I'm sure I've also made it onto her prodigious address list.) She asks the reader to look at those times in our lives when we were at the right place at the right time and to acknowledge that these weren’t coincidences. Some of this overlaps the keynote addresses she gave at Mount Hermon, other parts of it are new. Some of it is her own story. Some of it comes from others. And page 72 is all mine. Before her career got off the ground, Macomber made a list of famous people she wanted to meet and began pecking away at it. However, as she began to actually meet some of these people she found herself disappointed. Up close, some of the famous turned out to be unimpressive or even unpleasant. That caused her to begin looking closer at the non-famous, the people all around her whom she had previously looked right past. Then she began to examine those "coincidental" moments that she had previously not focused on, and to gather similar experiences from others. From those examinations came this book. Like any anthology, it can be read straight through, or in small doses. I’ll admit: I skimmed through until I found page 72. Now I’ve gone back and read some of the passages I skipped over, and others beyond. There’s some interesting stuff. It’s a book I can enjoy being a part of. I was at the right place at the right time, and I'm glad for it. It wasn't very big, but neither was it going to get any bigger, so today I clipped my little dragon fruit and split it with Vicki. That works out to 46 days from hand pollination to plate, and puts an end to the fun little episode that began here. It was delicate, sweet, and everything I could have asked for, except bigger. The main suspense came with the first slice of the skin, since I had been hoping for the variety with white insides rather than purple. The dragon gratified even that desire. Ah, the little delights of life. Actually, for a garden that gets very little attention after school starts in August, I continue to find delights anytime I can get out there. 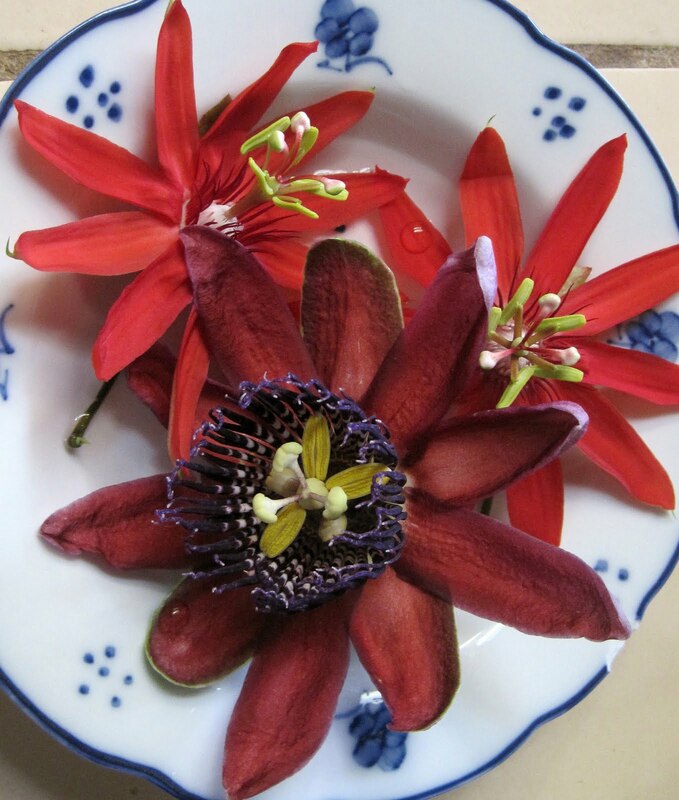 It is a full week into November, but rather than calling it quits for the year, two varieties of passion vine seem to be accelerating their bloom. 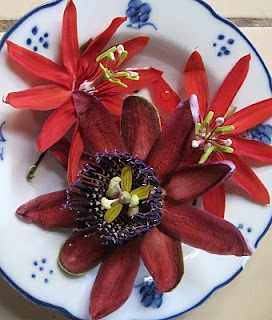 The red Passiflora vitifolia opens upward, while the lavender P. amethyst (amethystina?) wants to hang its blossoms downward. Today I harvested both the lingering summer crops (cherry tomatoes and a handful of Italian Honey Figs), fall crops (persimmons, pomegranates, and pineapple guavas), and a winter crop (one freak navel orange). Oh, and one tropical fruit that shouldn't even grow in our area . . .
. . . a delightful little Chinese dr agon.